Alejandro Jodorowsky's unmade movie of Frank Herbert's trippy space opera Dune has long been a legend among film geeks. But now, a new documentary takes us all the way inside this failed production — and inside the minds of the wild visionaries behind it. We saw Jodorowsky's Dune last night at our special screening, and images and ideas from it are still sparking in our brains. The documentary uses animation and some other clever tricks to bring the masses of storyboards and concept art from this production to life, but also listening to people talk about the project and hearing the passion in their voices is kind of fascinating and infectious. 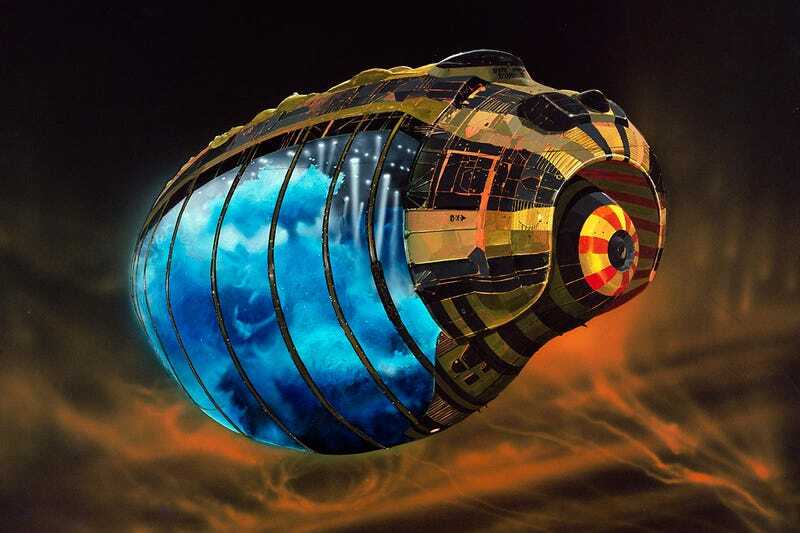 See Jodorowsky&apos;s Dune with io9 in San Francisco This Thursday! You come away with the sense that this would have been one of the strangest and most beautiful films ever — but it also might have been another Zardoz, kind of. Another 1970s weirdfest with stark wonderful imagery, best watched at three AM with multiple intoxicants. This film may have done more good by not being made — and the version of Jodorowsky's Dune that you have in your mind's eye after seeing the documentary is probably the best version that could ever have existed. But we'll never know. In any case, the documentary takes you through the whole process of making this film, and there are two main strands — on the one hand, the design team on the film is like a Who's Who of amazing artists, including Chris Foss, Moebius, H.R. Giger and Dan O'Bannon. And Jodorowsky deserves a ton of credit for introducing most of those men to the movie industry. On the other hand, the casting process is sheer lunacy, as Jodorowsky jets around recruiting Salvador Dali, Orson Welles, Mick Jagger, David Carradine and his own extravagantly tortured son to star in the film. This documentary is a must-watch for anybody who's obsessed with the history of science fiction cinema — but it's also a beautiful celebration of creative madness and the pursuit of a vision in the face of impossible obstacles. It's hilarious and strange and very, very trippy. And for more about the film, check out our sister site Gawker's way more detailed writeup.